This trail is intended for experienced mountain bikers only. Hazardous sections containing mud, sand/soft soil, exposed roots, and rocky uphill and downhill terrain exist throughout the trail. The use of a helmet is recommended and caution be taken to avoid injury and equipment damage. Park visitors using this trail do so at their own risk. Various trail loops from 4.7 to 32.2 km in length. The Minnesing Mountain Bike Trail is open from late June to mid-October (conditions permitting). For current trail conditions contact Algonquin Park Information. During the winter months this trail is the Minnesing Wilderness Ski Trail. 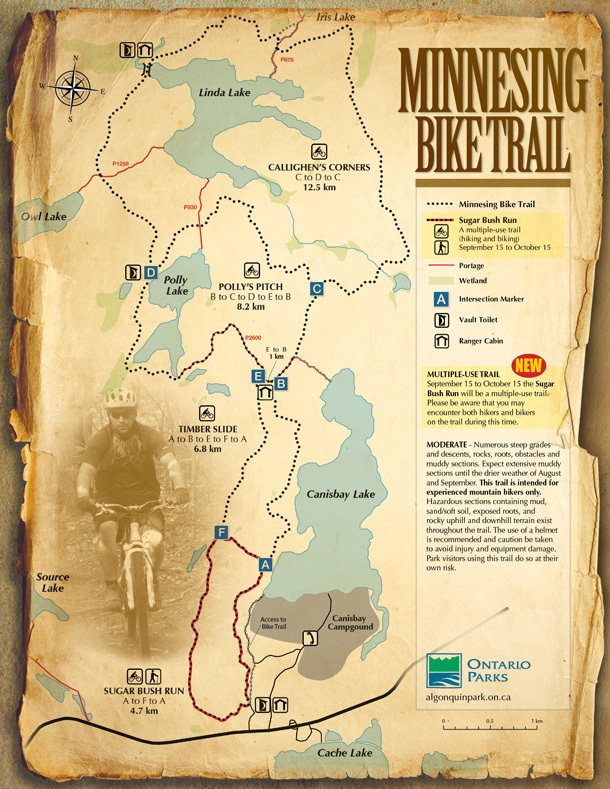 Click below for a trail map for Minnesing Mountain Bike Trail.